Beyond the unimaginable feat of running more than 3,000 kilometres across India in 2016, other factors such as huge crowds, massive festivals and extreme weather all combine to posed some unique challenges for social entrepreneur Samantha Gash. In 2010 she pushed her mind and body to the ultimate limit when she became the first female and youngest person ever to complete RacingThePlanet 4Deserts Grand Slam Challenge in 2010. The 4 Deserts Grand Slam requires competitors to run four, 250km ultra marathons across the driest (Chile), windiest (China), hottest (Sahara) and coldest deserts (Antarctica) on earth. When all four races are completed in one calendar year, it is regarded as one of the toughest endurance events on the planet. In 2011 she completed a 222 km nonstop run in the Himalayas, which challenged her to run at 6,000 metres above sea level, in an event that had only been completed by one man. Incredibly she was able to survive the pain, sickness, extreme heat and then white out conditions to complete the race. It was during this adventure that she decided to commit her life to running for change. Sam has always had a desire to help others and completed a law degree at Monash University with this in mind. The Run India campaign strengthened her resolve to share future adventure experiences with other women. “I’ve always been interested in grassroots development and I studied law because of my aspiration to work for the UN and undertake field work but I ended up in corporate law so that was never going to last,” she laughed. And now, instead of law, it is running that allows her to contribute. It was back in 2008 when she was completing her degree that she took up running as a kind of study break. She just managed to complete the Melbourne Marathon that same year but almost pulled out at the 32 km mark and said that her mental weakness surprised her. She says it’s that insight into what it means to be vulnerable that informs her work as a social entrepreneur, helping some of the world’s most needy communities. 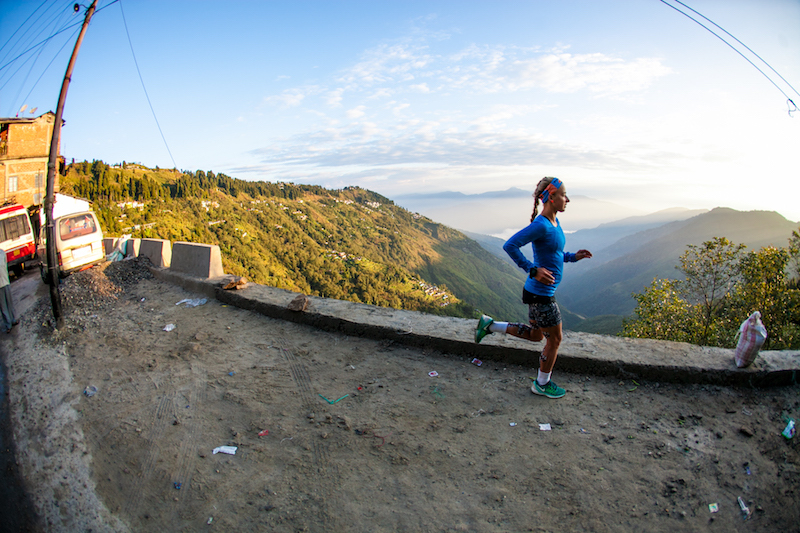 Throughout her running career she has seen the way ego can diminish the adventure experience. This support for others is what drives Sam to cover such unimaginable distances. She partnered with World Vision for the Run India venture which saw her run 3,253 kilometres over 77 days raising funds for educational initiatives across the country. Run India project was based on the premise that quality education can be the foundation that helps young people around the world achieve their dreams. Education is also a fundamental human right but one that too many children miss out on. As she ran through India from one of the driest deserts on earth (Jaisalmer, Rajasthan) to the Shillong, Meghalaya she visited many of the World Vision projects seeing first hand the work they do and witnessing the incredible stories of change. World Vision estimates that in India today, 4% of children never start school, 58% don't complete primary school, and 90% fail to finish high school. On top of this, 67.7 million Indian youths are living on less than one dollar a day. So it’s clear that the barriers preventing children from accessing - and completing, a quality education, are complex and so World Vision adopts a holistic approach, tackling issues such as malnutrition, access to appropriate water and sanitation, early marriage and gender bias. In addition to her running, Sam is a sought-after corporate speaker both in Australia and internationally. Her immediate goal is to fulfil a publishing deal to write her as-yet untitled autobiography.